An Evison/Poulsen cultivar introduced in 1997 to celebrate the Centenary Year of EMI, the record label company and the song title "Blue Moon", one of their best selling song titles. Raised by Raymond Evison in his Guernsey nursery. A compact free flowering plant, suitable for any position in the garden, the flowers retaining their colour best in a shady situation. An ideal plant for container culture, for the patio or small garden. The flowers measure 15-18cm (6-7in) across and have a base colour of white, which is suffused with pale lilac becoming darker at the edges of the tepals. The tepals have most attractive wavy edges, a stunning feature of the flower. The slightly smaller summer flowers are generally darker in colour. The pretty tepal colour is shown to great effect by the contrasting dark red anthers. 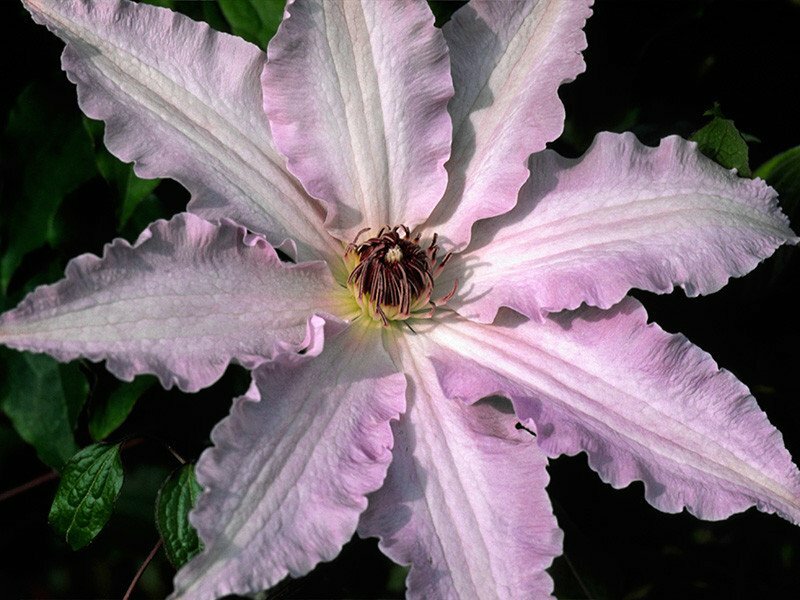 A very good cut flower clematis. Launched at the 1997 Chelsea Flower Show.